Slowly getting back to normal! And posts like this help. This we know: Top carnivores profoundly influence local ecosystems. By STARRE VARTAN October 26, 2018. The American people’s relationship with top predators — especially wolves — is complex and ever-evolving. About three decades ago, it was mostly just animal-rights groups and their supporters who fought for the wolves’ right to exist; they were often considered a nuisance. But now there’s plenty of scientific evidence proving what’s good for wolves is good for their prey, the plants those prey eat, and indeed, positively affects the entire ecosystem. That’s ultimately good for humans too — unless you’re competing with the wolves, like a rancher who grazes animals or a hunter who wants to shoot the same deer or moose that wolves need to eat. But at this point, even some ranchers and hunters have come over to the pro-predator side. Already, the moose population on the island has boomed, “undoubtably because of lack of predation,” John Vucetich, a wildlife ecologist from Michigan Technological University told Science magazine, adding that the two remaining wolves are now “… swimming in moose.” Despite the wolves’ regular predation on moose, there’s been a 20 percent increase in moose in just one year, which scientists estimate is about five to 10 times higher than on mainland areas. Beaver populations have also risen sharply. There’s just not enough wolves to keep either population in check. So what’s so bad about so many moose? Well, as most ungulates do, moose spend their days browsing on vegetation, so the more moose, the more food they need — and the plants on the island can only take so much nibbling. An aquatic plant, which was found in abundance just six years ago, is now only found in places where moose are not. Long-term, this means the island will soon run out of food to keep the ever-larger moose population alive, and many will starve once food becomes scarce. Previously, the wolves have kept moose populations low enough so they didn’t overeat the vegetation, keeping the system in balance. This is why some people think the best solution is to bring a fresh influx of wolves to Isle Royale National Park. The plan is to release 25-30 wolves over the next three to five years. So far, park officials have trapped four wolves on the mainland beginning in late September and released them on the island. Three of the wolves are female — with the hope they will successfully breed. This new blood would potentially rebalance the predator-prey relationship and the idea is that the rest of the ecosystem would follow. Introducing so many wolves over several years is hardly natural either, others argue, saying that humans should just be hands off and let nature take its course. The original 50 wolves had found their way to the island on their own, having moved in from Canada; perhaps they could do so again if given the chance. Editor’s note: This article has been updated since it was originally published in April 2017. Changing the world – one wolf at a time. I read this wonderful story yesterday morning and wanted to share it with you all. It is a story carried by The Madras Pioneer. A male and a female wolf have been photographed with their two pups on the northern part of the reservation. PHOTO COURTESY OF THE CONFEDERATED TRIBES OF WARM SPRINGS – Two wolf pups with the adult male of the pack are caught on a remote trail camera on the Warm Springs Reservation. The wolf pups are believed to be the first born on the reservation since the 1940s. For at least the past four years, a large male wolf has been observed roaming parts of the Warm Springs Reservation. Now, the wolf, his mate and two pups have also been seen on trail cameras. On Aug. 27, the Confederated Tribes of Warm Springs Branch of Natural Resources confirmed that the single male first observed in 2014, and his mate, first seen in 2016, have produced two pups. “In early September 2014, biologists suspected that a large male wolf of unknown origin, more than likely from Northeast Oregon, had a mate on the Warm Springs Reservation and Mount Hood National Forest, when remote cameras captured several images of two or more wolves in the area,” said wildlife biologist Austin Smith Jr., of the tribes’ Natural Resources Branch. 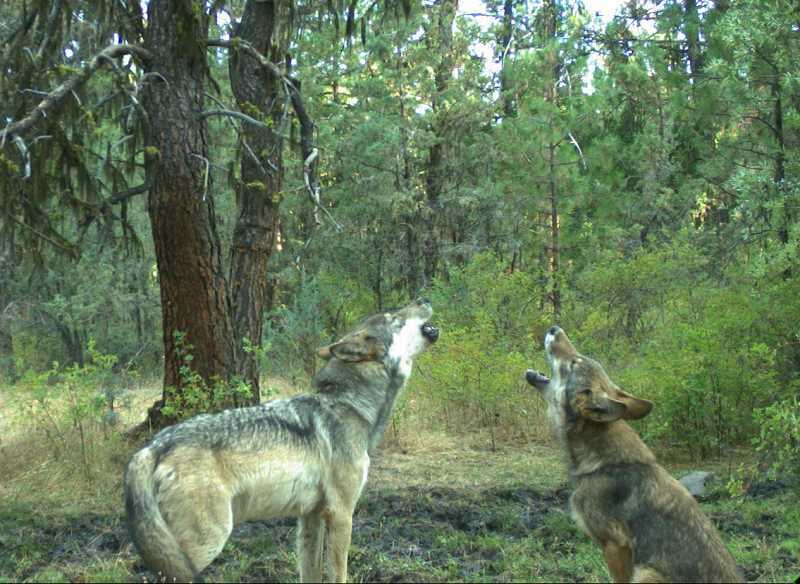 PHOTO COURTESY OF THE CONFEDERATED TRIBES OF WARM SPRINGS – A female gray wolf from the Warm Springs/White River pack seems to be caught on a remote trail camera teaching her pup, on the right, how to howl. In August, the Confederated Tribes of Warm Springs’ Branch of Natural Resources caught the photos of the two adult wolves and two pups, which are estimated to be 3 to 4 months old. After they saw the pup, Smith notified the U.S. Fish and Wildlife Service, which keeps track of wolf activity. At the end of 2017, Oregon had at least 124 gray wolves, including two known as the White River pair. With assistance from USFW Biologist John Stephenson, the tribes set up remote trail cameras, which have been yielding numerous images of the wolves, including the pups. Gray wolves, which had historically been common in Oregon, were eradicated in the late 1940s. In 1974, wolves were listed as endangered by the federal Endangered Species Act. The state enacted its own Endangered Species Act in 1987, requiring the Oregon Department of Fish and Wildlife to conserve wolves. According to ODFW, the wolves in Oregon are part of the Northern Rocky Mountain wolf population, which was reintroduced in Idaho and Yellowstone National Park in the mid-1990s. The first wolf made its way to Oregon in the late 1990s. Over the past decade, the documented population of wolves in Oregon has increased from about three in 2008, to 14 at the end of 2009, to 124 at the end of 2017. Most packs are located in Northeast Oregon. The wolf pups are probably 3 to 4 months old, and weigh 75 to 100 pounds, he estimated. The tribes’ Branch of Natural Resources will continue to monitor the pack and its movements to ensure an accurate population count. Smith said that the wolves are an important resource on the reservation. “They’re a culturally significant and sensitive species,” he said. Well done Oregon and in particular well done the good folk of the Warm Springs Reservation. Here are a couple of photographs I found online to share with you. Thinking of culturally significant and sensitive animals, I must go and hug a dog or six! Just a few days ago, on May 1st to be precise, I published the post Dogs and Humans. Good to see you back, glad to hear you had an enjoyable trip. I went across to Colin’s latest blog post and immediately wanted to share it with you all in this place. It also seemed appropriate to ask Colin for his introduction. 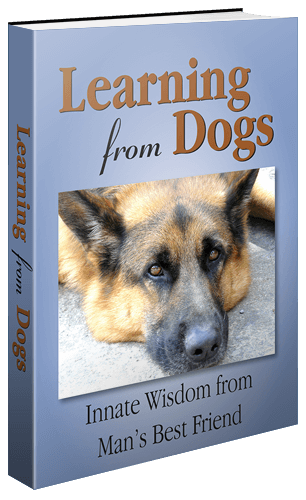 But here’s what he offered: “When Paul asked me if I would be willing to turn this post into a guest post for Learning from Dogs, I was more puzzled than anything else. The only words here that aren’t my own are those where I explain that all I did was transcribe George Monbiot’s words from the video.” I’m bound to say that the transcription was a grand job! Anyway, here is Colin’s post. When wolves were reintroduced to Yellowstone National Park in the United States after being absent for nearly 70 years, the most remarkable ‘trophic cascade‘ occurred. In this short film, George Monbiot explains what a trophic cascade is, and how wolves do actually change rivers. One of the most exciting scientific findings of the past half century has been the discovery of widespread ‘trophic cascades’. A trophic cascade is an ecological process which starts at the top of the food chain and tumbles all the way down to the bottom, and the classic example is what happened in the Yellowstone National Park in the United States when wolves were reintroduced in 1995. Now, we all know that wolves kill various species of animals, but perhaps we’re slightly less aware that they give life to many others. Before the wolves turned up, they’d been absent for seventy years, but the numbers of deer — because there’d been nothing to hunt them — had built up and built up in the Yellowstone Park and despite the efforts by humans to control them, they’d reduced much of the vegetation there to almost nothing; they’d just grazed it away. But as soon as the wolves arrived, even though they were few in number, they started to have the most remarkable effects. First, of course, they killed some of the deer. But that wasn’t the major thing: much more significantly, they radically changed the behaviour of the deer. The deer started avoiding certain parts of the park: the places where they could be trapped most easily, particularly the valleys and the gorges — and immediately, those places started to regenerate. In some areas, the height of the trees quintupled in just six years; bare valley sides quickly became forests of aspen, and willow, and cottonwood. And as soon as that happened, the birds started moving in. The number of songbirds and migratory birds started to increase greatly. The number of beavers started to increase because beavers liked to eat the trees; and beavers, like wolves, are ecosystem engineers, they create niches for other species. And the dams they built in the rivers provided habitats for otters and musk-rats and ducks and fish and reptiles and amphibians. The wolves killed coyotes, and as a result of that, the number of rabbits and mice began to rise, which meant more hawks, more weasels, more foxes, more badgers. Ravens and bald eagles came down to feed on the carrion that the wolves had left. Bears fed on it too, and their population began to rise as well, partly also because there were more berries growing on the regenerating shrubs. And the bears reinforced the impact of the wolves by killing some of the calves of the deer. But here’s where it gets really interesting: the wolves changed the behaviour of the rivers. They began to meander less, there was less erosion, the channels narrowed, more pools formed, more riffle sections, all of which was great for wildlife habitats. The rivers changed in response to the wolves. And the reason was that the regenerating forests stabilised the banks so that they collapsed less often, so that the rivers became more fixed in their course. Similarly, by driving the deer out of some places and the vegetation recovering on the valley sides there was less soil erosion, because the vegetation stabilised that as well. So the wolves, small in number, transformed not just the ecosystem of the Yellowstone National Park, this huge area of land, but also its physical geography. As that quote from John Muir infers, we are all connected. No better illustrated by a very sad piece of research news that will be the topic for tomorrow’s post. Why are dogs so very happy to see us? When I first started writing this blog, more than six years ago now, I had no idea whatsoever that the community of friends who read and follow Learning from Dogs would develop to the point where the volume of ideas and suggestions sent in are, are by far, the biggest source of creative posts. Take today’s for example. The link to the article was sent to me by Chris Gomez a little over a week ago and yesterday was the first time that I read the article in full. It’s a fascinating and incredibly interesting piece. So with no further ado, besides thanking Chris so much for sending it on, here is: Why Are Dogs So Insanely Happy to See Us When We Get Home? In order to gain an appreciation for dog behavior, it’s important to understand that dogs are descended from wolves (or at least a common wolf-like ancestor). Clearly, the two species, separated by about 10,000 to 15,000 years, share a lot in common. But there’s only so much we can extrapolate from wolves; dogs are categorically different by virtue of the fact that their ancestors actively sought out the company of humans. Making matters even more complicated is the realization that Paleolithic era wolves are not the same as the ones around today. Consequently, any inferences we make about dog behavior and how it relates to wolves is pure speculation. Neuroscientist Gregory Berns, author of How Dogs Love Us, says there’s a fundamental difference between modern wolves and those that lived long ago. That said, however, Berns says we can clearly see behaviors in wolves that are similar to those expressed by dogs. 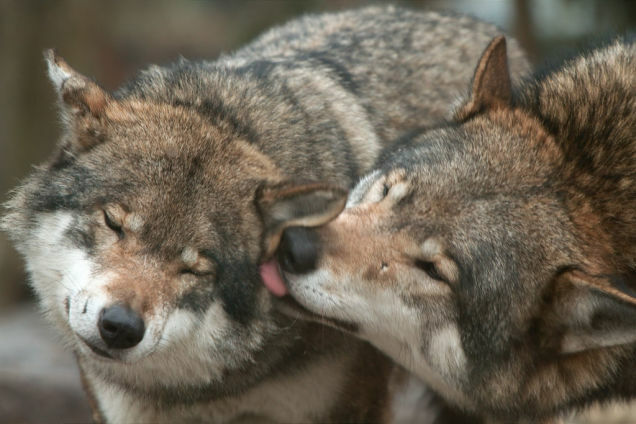 For instance, wolves greet each other by licking each others’ faces. For these pack animals, this licking behavior serves as an important social greeting, but also as a way to check out and determine what the other wolves have brought home in terms of food. 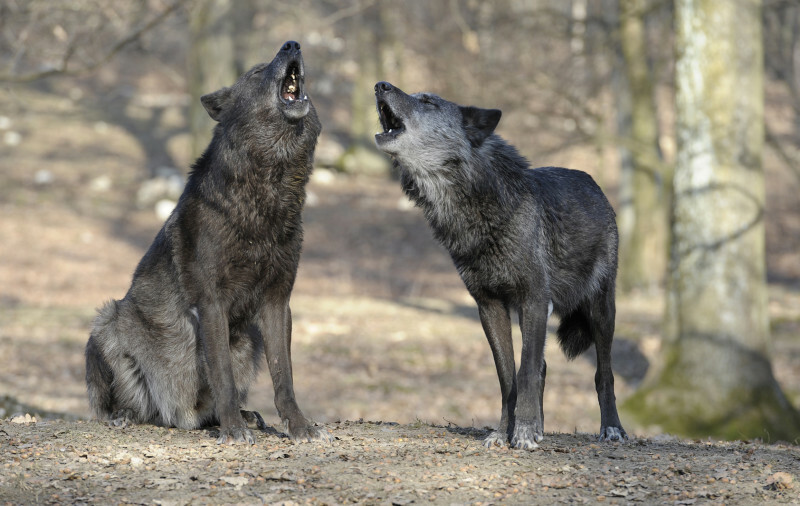 Wolves, says University of Trento neuroscientist Giorgio Vallortigara, greet each other in different ways depending on the type of individual relationships they’ve forged. Feral dogs, he says, behave in similar ways. But the big change in terms of adaptive sociality has been the ability of domesticated dogs to interact with humans using our own communicative signals, such as gazes and gestures. Dog expert Jessica Hekman, who blogs at DogZombie, has witnessed greeting behaviors among wolves first hand. At the same time, dogs exhibit behaviors that are markedly different from wolves. As Hekman explained to me, one of the most dramatic differences between dogs and wolves is the ability of dogs to accept novelty. Simply put, dogs are less fearful than wolves. Indeed, given their wolf ancestry, it’s remarkable that dogs get along with humans so well. But as Berns pointed out to me, sociability has turned out to be a rather powerful adaptation, one that has worked a lot better for dogs than it has wolves. Berns says that whatever the sociality that dogs have evolved, one of the defining traits of a dog is the degree to which they will interact with humans as well as other animals. 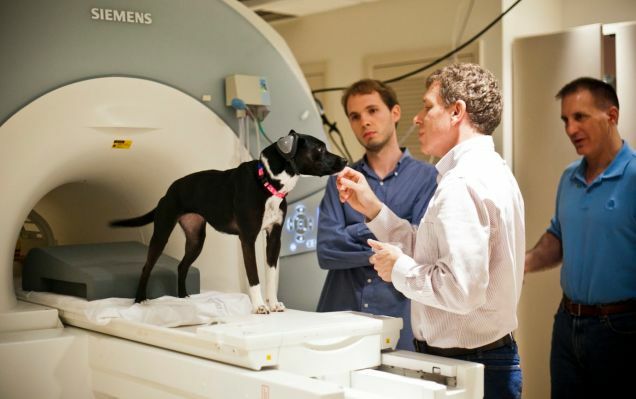 A key aspect of Berns’ brain imaging research is to study how dogs perceive us. We humans know that dogs are a separate species, but are dogs cognizant of this as well? Or do they see us as members of their pack, or as some kind of weird dog? According to Berns’ research, dogs that are presented with certain smells in scanners can clearly tell the difference between dogs and humans, and also discern and recognize familiar and strange odors. In particular, the scent of a familiar human evokes a reward response in the brain. Berns stresses that dogs are social with us not just because of their scavenging tendencies. Hekman says it’s hard to know what dogs are thinking, but she suspects they understand that we’re not quite like them. As evidence, she points to aggressiveness in dogs as it’s directed to other dogs and humans—differences that aren’t correlated. She says it’s quite common for a dog to have a problem with one and not the other. In other words, dogs appear to perceive other dogs as one group, and humans as a separate group. What’s more, dogs will seek the help of humans and not other dogs—a possible sign that dogs understand that humans have resources that dogs do not, and are thus a different kind of social entity. But do dogs see us as part of the pack? Virtually all experts agree that the happiness dogs feel is comparable to what humans experience, and that it’s similar to how humans feel towards each other. Berns says that dogs don’t have the same language capacities as humans, and that they’re not capable of representing things in their memory like we can. Because dogs don’t have labels or names for people, he suspects that they have an even purer emotional response; their minds aren’t filled with all sorts of abstract concepts. 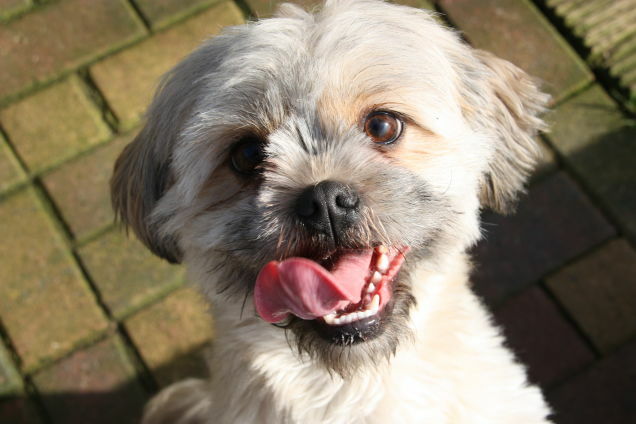 A dog’s particular greeting, however, is dependent on several factors, such as the dog’s temperament, the personality of the owner, the nature of their relationship, the level of stress and anxiety, and the dog’s tendency/capacity for self-control. It’s important to note, however, that stress manifests differently in dogs than it does in humans. Dogs will sometimes go solo on a temporary basis if they’re sufficiently motivated to do so, but they do it knowing that social contact can be resumed at virtually any time. “The exaggerated level of greeting that can be observed in some dogs is likely due to the fact that they have not yet learned to accept the possibility of non-voluntary detachment,” says Vallortigara. When trying to appreciate a dog’s over-the-top greeting, Hekman says we need to imagine what it was like for a dog to be alone all day while we were gone. 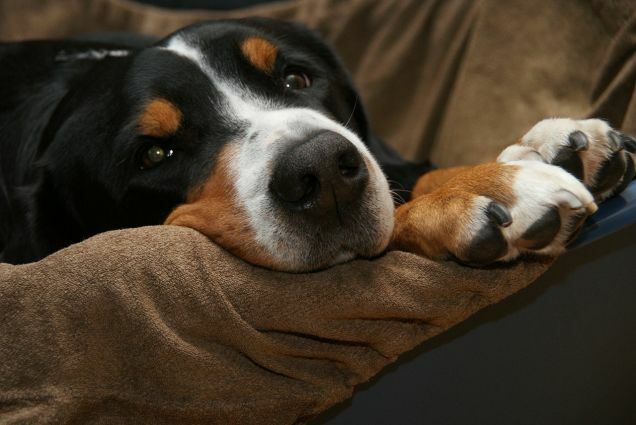 It’s obviously important to respond to your dog when you get home, but according to Marcello Siniscalchi, a veterinary physician from the University of Bari, how you should react will depend on the context of the situation and the needs of the dog itself. Hekman says there’s definitely a tension between our buttoned-down greeting rituals (“Hi, honey, I’m home!”) and theirs (“I want to lick you on the face repeatedly!”). Hekman stresses that, for any dog, it’s important for us not to tell them what not to do (e.g. “don’t jump on me!”), but to tell them what to do. 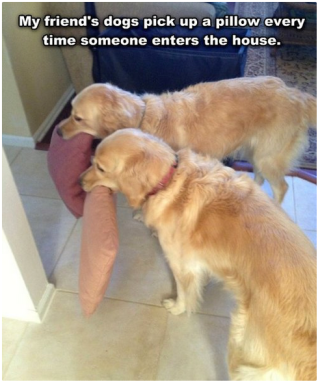 “Many is the retriever owner who has taught their dog to get a toy when they come home to channel their excitement,” she added. The main point, she says, is that it’s important for dogs to have the greeting ritual, but it can be redirected in ways to make it easier on the owners such that everyone enjoys it. So a huge thank you to all of you that send in remarkable items for Learning from Dogs. Dogs and wolves – fascinating research. I have been saving this report for a few weeks. Following yesterday’s great news about the latest concerning wolves in Oregon, today seemed a perfect follow-on with a report first published in online journal PLOS ONE. However, what follows is a full republication of the report as I read it on the Science Daily website. Summary: Although wolves and dogs are closely related, they show some striking differences. Scientists have undertaken experiments that suggest that wolves observe one another more closely than dogs and so are better at learning from one another. The scientists believe that cooperation among wolves is the basis of the understanding between dogs and humans. Wolves are considerably better imitators than dogs. Although wolves and dogs are closely related, they show some striking differences. Scientists from the Messerli Research Institute at the University of Veterinary Medicine, Vienna have undertaken experiments that suggest that wolves observe one another more closely than dogs and so are better at learning from one another. The scientists believe that cooperation among wolves is the basis of the understanding between dogs and humans. Their findings have been published in the online journal PLOS ONE. Wolves were domesticated more than 15,000 years ago and it is widely assumed that the ability of domestic dogs to form close relationships with humans stems from changes during the domestication process. But the effects of domestication on the interactions between the animals have not received much attention. The point has been addressed by Friederike Range and Zsófia Virányi, two members of the University of Veterinary Medicine, Vienna (Vetmeduni Vienna) who work at the Wolf Science Center (WSC) in Ernstbrunn, Niederösterreich. The scientists found that wolves are considerably better than dogs at opening a container, providing they have previously watched another animal do so. Their study involved 14 wolves and 15 mongrel dogs, all about six months old, hand-reared and kept in packs. Each animal was allowed to observe one of two situations in which a trained dog opened a wooden box, either with its mouth or with its paw, to gain access to a food reward. Surprisingly, all of the wolves managed to open the box after watching a dog solve the puzzle, while only four of the dogs managed to do so. Wolves more frequently opened the box using the method they had observed, whereas the dogs appeared to choose randomly whether to use their mouth or their paw. The researchers think that it is likely that the dog-human cooperation originated from cooperation between wolves. During the process of domestication, dogs have become able to accept humans as social partners and thus have adapted their social skills to include interactions with them, concomitantly losing the ability to learn by watching other dogs. Story Source: The above story is based on materials provided by Veterinärmedizinische Universität Wien. Note: Materials may be edited for content and length. So if you, like me, are one of many people who believe that your dog knows what you are thinking, then we need to thank the wolf!